Tom Mango is a litigator with more than 20 years of experience handling intellectual property, unfair competition, and complex commercial litigation for both national and international clients across a wide variety of industries. 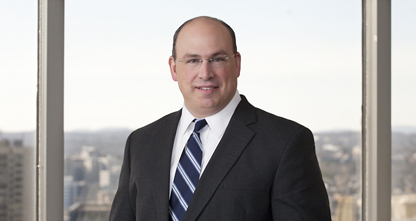 His practice focuses on all aspects of opposition and cancellation proceedings at the Trademark Trial and Appeal Board, trademark litigation in federal courts throughout the US, and global and/or complex trademark disputes. He also counsels clients regarding trademark portfolio protection, enforcement strategies, claim avoidance, and risk management. MySpace, Inc. v. OurSpace.com Media, LLC, Opposition No. 91185197 (TTAB). Represented social media and entertainment company. After discovery, negotiated favorable settlement for our client. Speed Channel, Inc. v. Phoenix 2008 LLC, Opposition No. 91189418 (TTAB). Represented Cable Network. After considerable discovery, the applicant expressly abandoned four applications at issue. SABIC Innovative Plastics IP B.V. v. AY Tech LLC, Opposition No. 91202966 (TTAB). Represented petrochemical manufacturer. Obtained default judgment for our client. Amerifit Inc. v. Metagenics Inc., Civil Case No. 3:10-cv-00596-JCH (D. Conn.). Represented nutritional supplement company. After discovery, negotiated favorable settlement for our client. Managed Air Systems LLC v. New England Booth & Equipment, Inc., Civil Case No. 3:10-cv-01343-MRK (D.Conn.). Represented spray booth and paint booth distributor. After complaint was filed, negotiated favorable settlement for our client. Premier Horticulture Ltd. v. Omex Agriculture Inc., Opposition No. 91201179 (TTAB). Represented manufacturer of horticultural and agricultural products. After notice of opposition was filed, negotiated favorable settlement for our client. Dreamwell, Ltd. v. Sheex, Inc., Opposition No. 91208090 (TTAB). Represented mattress manufacturer and distributor. Obtained default judgment for our client. OSRAM SYLVANIA Inc. v. SCRAM Technologies, Inc., Opposition No. 91207691 (TTAB). Represented lighting products company. Obtained default judgment for our client. Innovation Ventures, LLC v. Maximum Human Performance, LLC, Opposition No. 91201227 (TTAB). Represent supplement company attempting to register the mark 8 HOUR ALERT over objections by owner of 5 HOUR ENERGY. The Fairfield Processing Corporation v. JS Fiber Co., Inc., Civil Case No. 5:12-cv-00019-RLV-DCK (W.D.N.C.). Represent craft product manufacture enforcing the mark POLY-FIL.